As Berlin becomes an increasingly popular tourist destination, the city becomes even easier to reach, with extremely frequent flights and good connections from all over the world. In general, flying into Germany tends to be a relatively hassle-free experience. Located 6 miles / 9 km north-west of central Berlin, this main airport handles a large number of international and domestic flights. 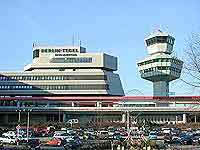 Berlin-Tegel Airport also deals with daily flights to and from many UK airports and primarily serves Western European destinations. This airport has one large passenger terminal which is usually very busy. There are 36 scheduled major airlines, including Lufthansa, Germany's principal airline, Air Berlin, Air France, Alitalia, British Airways, Continental Airlines, Deutsche BA, Iberia, Olympic Airways and Turkish Airlines. 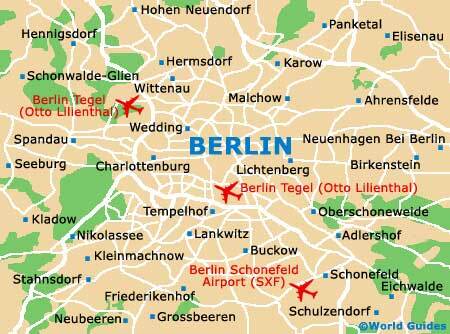 Book your Berlin TXL Car Rental here. The JetExpressBus TXL departs from the airport daily every 15 minutes, between 06:00 to 23:10. The buses travel to Potsdamer Platz, Friedrichstrasse and Unter den Linden, which is a short journey of around 20 minutes. There are also buses which travel to Jakob-Kaiser-Platz, then Bahnhof Zoo, departing every 10 minutes between 05:00 to midnight and to the U6 line at Kurt-Schumacher-Platz. Taxis are readily available and queue outside the main arrivals area.